Conference /banqueting 100/150. Rooms 30 (5 suites, 8 junior suites, 3 superior, 2 family, 15 ground floor, 2 wheelchair friendly, 2 shower only, all no smoking). B&B from about €60pps; ss applies. SC discretionary. Lift. Turndown service. All day room service. Free broadband wi/fi, laptop sized safes in bedrooms. Children welcome (under 12s free in parents room, cot available free of charge, baby sitting arranged). 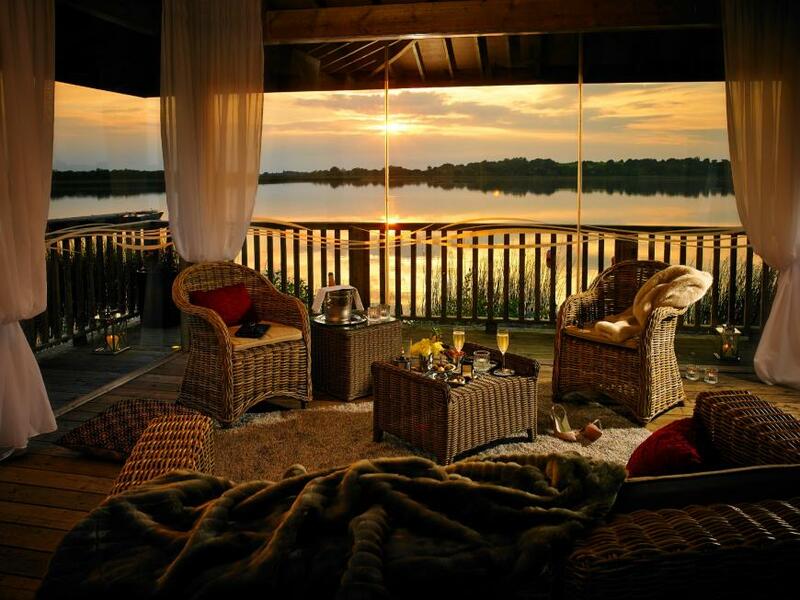 Walking; fishing; garden; jacuzzi; treatment rooms; relaxation room. No pets. Restaurant Seats 120 (private room, 50; outdoor seating, 50). Restaurant from 5pm daily; Lounge Menu 12-9pm daily; Afternoon Tea 12-4pm. Early D 5.30-6.30pm, 2 courses €22.95; Table d'Hote D 5.30-10pm; Sun L 2.30-4.30pm, 2 courses €22.95; wines from €25. Toilets wheelchair accessible. Ample parking; heli-pad. Closed 24-26 Dec. Amex, Diners, MasterCard, Visa. 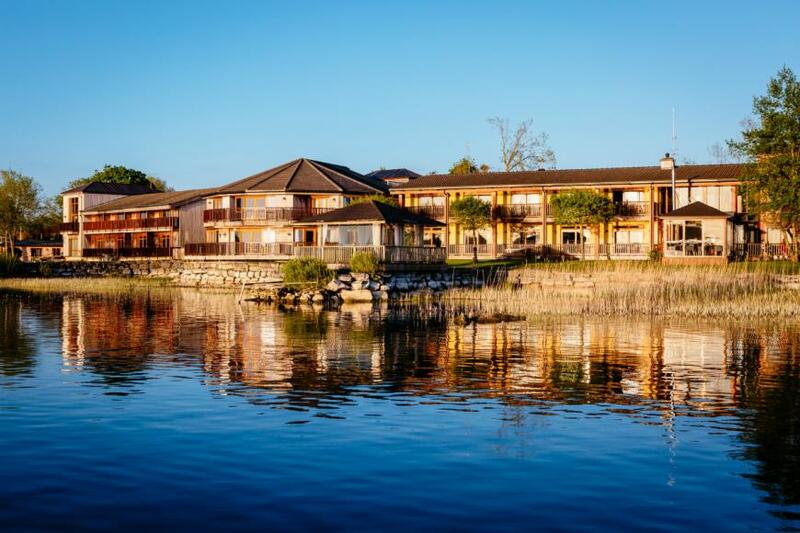 Ray Byrne and Jane English’s lovely lakeside lodge styles itself ‘Ireland’s first wine hotel’ and, although it is not an hotel but a four star guesthouse, the accommodation - which now offers thirty beautiful rooms, a hot tub and treatment rooms - is nothing less than stunning. A covered lakeside boardwalk leads to the front door: you enter your guest key card and step into a different world. 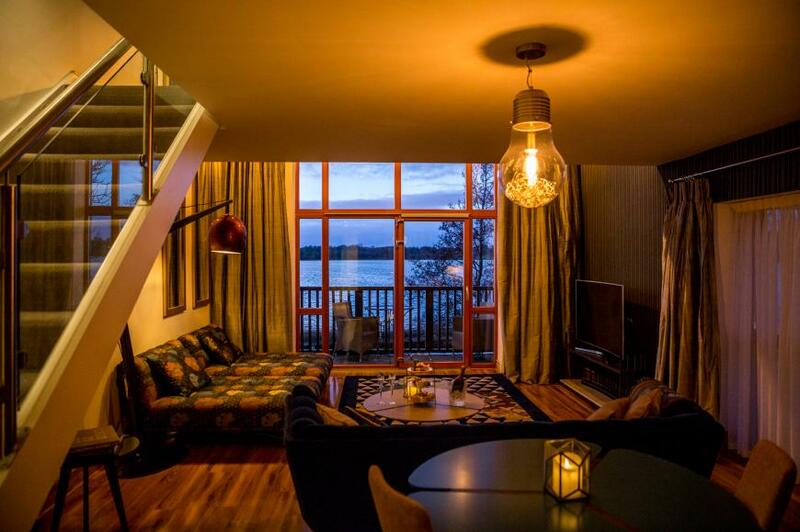 A lofty residents’ lounge with a stove and its own bar simply oozes style and comfort, a hint of the high pamper quota waiting above in spacious suites and guest rooms, all with private balconies overlooking the lake. 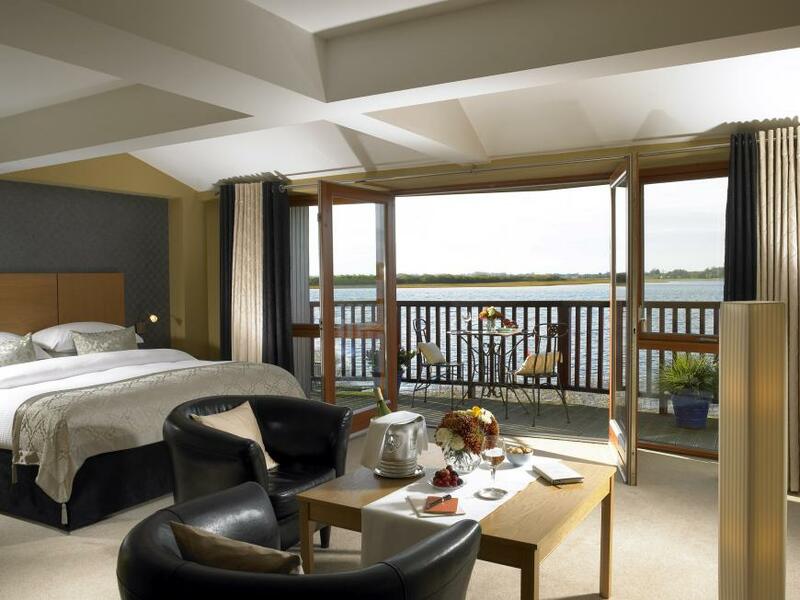 Superbly comfortable beds with goose down duvets and extra large pillows face the view, and seriously luxurious bathrooms have separate double-ended bath and walk-in shower. Wineport has a huge amount to offer discerning guests and has become a hot choice for business and corporate events as well as weddings and romantic getaways. 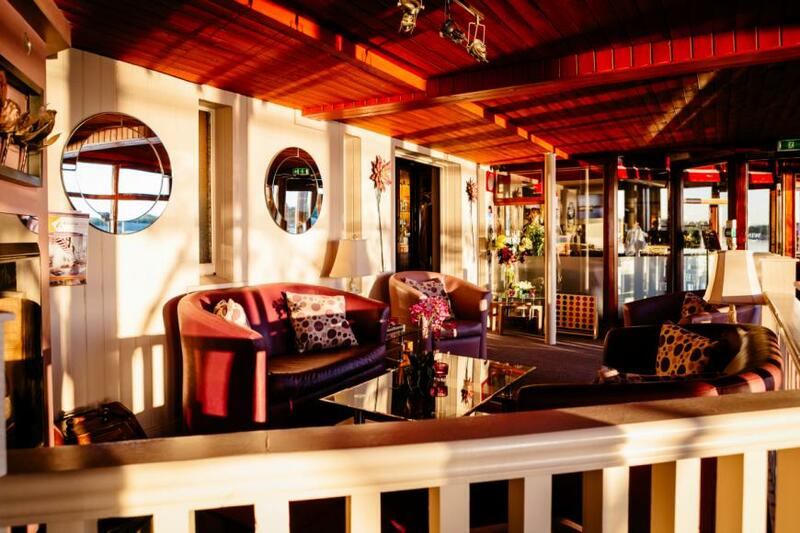 Luxurious, romantic, beautiful, businesslike, this is a place of many moods: Wineport has everything. 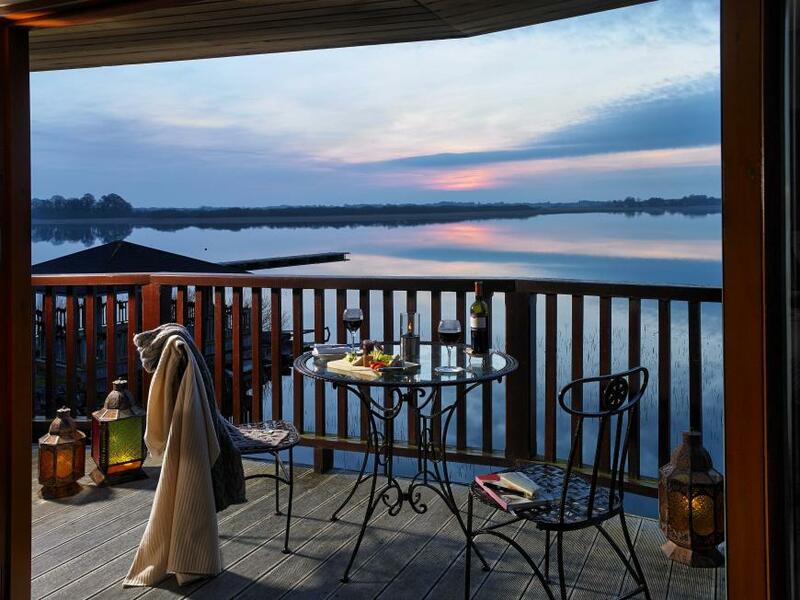 *Ray and Jane were the Guide’s Hosts of the Year in 1999, and Wineport was our Hideaway of the Year in 2003. 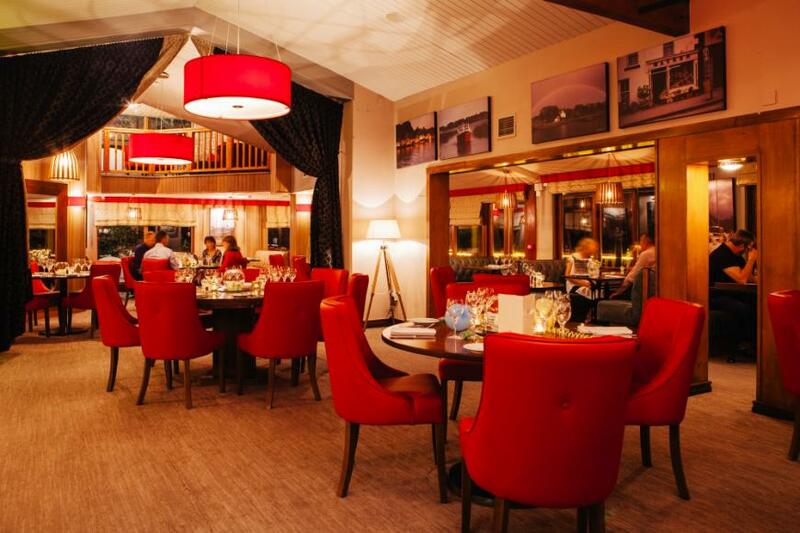 Wineport Lodge began life as a restaurant, and faithful fans continue to beat a path to the door at the slightest excuse, to be treated to a fine meal, served with warmth and professionalism in this lovely contemporary restaurant - and what a setting! Head Chef Austin Byrne's menus follow the house philosophy of showcasing local ingredients and artisan suppliers in a fresh modern Irish cuisine. Well-balanced seasonal menus have an international tone but they are based on Quality Assured and local ingredients which may include game in season (Dromoland Estate, Co Clare), beef from the Tormey family's Westmeath farm, Slaney Valley lamb, pork from Athlone butcher Horan's, mushrooms from Reilly Mushrooms in Glasson, and home-grown salads and herbs. Menus overlap quite a bit, so dishes such as Wineport soup with homebaked breads may appear on all menus, perhaps alongside one of the Horan's pork dishes - barbecued pulled pork on toast, with pickled vegetables and remoulade is a lovely, well balanced starter. Summer main courses might include an attractive fish dish such as colourful baked fillet of cod with creamed spinach, shrimps, cherry tomatoes; quite a few "signature" dishes carry supplements, including C.R.Tormey's 28 day dry-aged beef steaks (10oz striploin, rib-eye or T-bone). Creative vegetarian dishes make tempting mainstream choices and the use of vegetables in garnishes and side dishes is also imaginative - and the children's menu offers a very good compromise between what children think they want and proper adult menus, including dishes like organic smoked salmon penne pasta and mini fillet steak & pepper sauce alongside buttery corn on the cob and crispy goujons of chicken. Desserts include retro classics like baked Alaska and apple pie with creme anglaise alongside more unusual choices and the tea / coffee menu and wine list offer plenty of pleasant choices to round off the meal. Accomplished cooking and pleasing presentation make the most of the good ingredients selected - and, together with good service that combines relaxed pleasantness with efficiency, that can make a meal here memorable. An impressive and informative wine list charts a wine connection with the area going right back to 542AD, and makes very interesting reading; improvements are constantly made to the list, which offers special treats and many more affordable wines, and includes a good selection of wines by the glass and some well chosen half bottles. Midway between Dublin and Galway: take the Longford/Cavan exit off the M6 at Athlone; fork left after 4km at the Dog & Duck; 1.5km, on the left.